I was born and raised in Texas, mostly in the small town of Lufkin in the heart of East Texas. My parents (both teachers), sister and I spent many summer vacations traveling around the US in an old orange Volkswagen pop-top camper van. In junior high and high school, I ran with the band crowd and spent six years leading the trombone section. I also sang in my church choir, the Birmingham Concert Chorale (Alabama), and the Windy City Gay Chorus. In addition to Texas, I’ve lived in Idaho, Alabama, and North Carolina. My husband and I called Chicago our home for ten years before we moved to Los Angeles in late 2005. While majoring in landscape architecture at Texas A&M, I got to spend a semester in Italy. During seminary, one of my Korean classmates invited me to spend a month in South Korea, so Seoul was my stomping grounds for one hot, humid August! Being involved in charitable causes has always been important to me. I’ve worked on several Habitat for Humanity homes, collected food for local food pantries, and raised money for AIDS service organizations. One of the toughest things I’ve done was bike 500 miles from St. Paul, Minnesota to Chicago in 1998 in the Twin Cities-Chicago AIDS Ride…I didn’t even own a bike when I signed up for the ride! Raising the funds for this ride was the easy part. The ride was torture on my legs, but amazing for my soul. I’ve been a team leader for AIDS Walk Los Angeles for the past four years, which I have enjoyed immensely. After graduating from McCormick Theological Seminary in Chicago, I knew that traditional ministry wasn’t my calling. I worked for the seminary for four years, spent a year working for a refugee resettlement service, then a year as a barista at Starbucks. I now work at the Ithaca College Los Angeles Program as the Programs & Services Coordinator. I remember having a great time at the first wedding I went to as a child in Houston, Texas. It was my 2nd or 3rd cousin’s wedding, I’m pretty sure my family were the last guests to arrive, and there was dancing at the reception. Fun times! Since that wedding from long ago, I’ve either been to, been a part of (including my own!) or officiated at countless weddings! No matter if I was the officiant, groom, usher or just a happy guest, each wedding has been a joyful event, and that’s what I always strive for with my wedding couples. 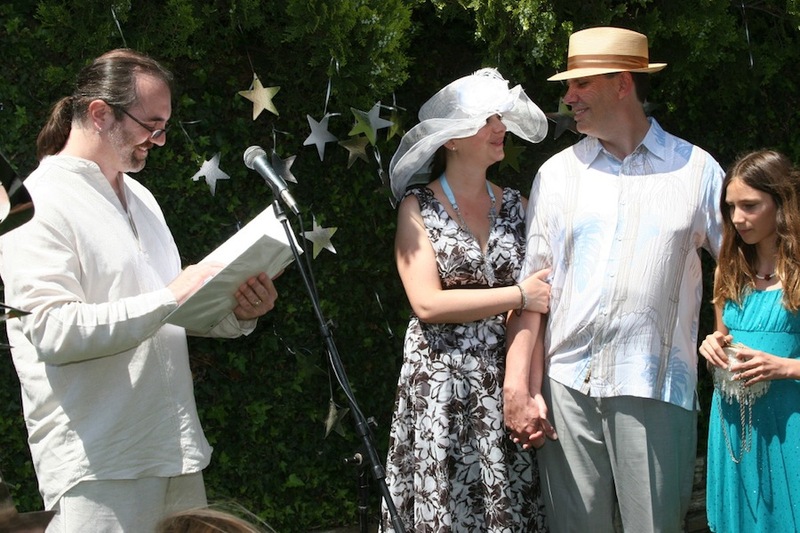 Now, as a wedding officiant serving couples throughout the Los Angeles area, I take my own experiences as a seminary educated officiant, readings and poetry I’ve discovered, your own stories and dreams, and the customs, traditions or special music or poetry you want included, then create and lead a ceremony that is uniquely yours.